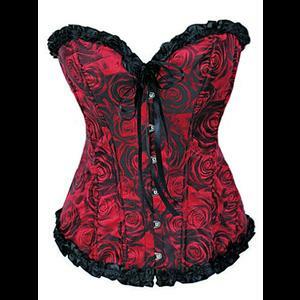 A stunning gothic boned corset made from reinforced cotton with a dramatic red and black roses print. 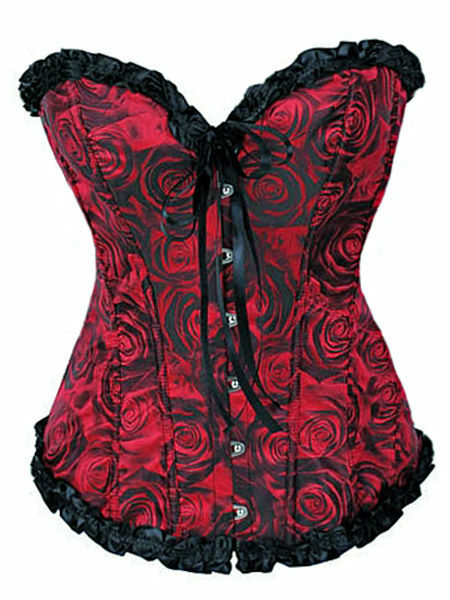 The corset has a front busk fastening with flat steel bones either side and the upper and lower hems are trimmed with ruffled black satin. The centre front has a double ribbon fastening and the back of the corset has adjustable eyelet and black satin ribbon lacing. The bust and waist measurements given below are the minimum measurements and a further 2" to 4" can be added to these by adjusting the back lacing. Bust: 30" Waist: 26" Length: 17"
Bust: 32" Waist: 28" Length: 17"
Bust: 34" Waist: 30" Length: 17"